We are pleased to present the Top 30 Coffees of 2018, Coffee Review’s sixth annual ranking of the most exciting coffees we tested over the course of the past year. Coffee Review’s goal is to celebrate coffee roasters, farmers and mill-owners who make an extra effort to produce coffees that are not only superb in quality but also distinctive in character. In particular, we aim to honor the dedication of coffee producers large and small who, with the support of their roaster and importer partners, are crafting a range of sensory excellence and diversity that has never existed before in the history of the beverage. In 2018, we tasted nearly two thousand coffees and published more than 300 reviews of the highest rated of those samples. For those who are curious about how we conduct our testing and rating processes at Coffee Review, see How Coffee Review Works. This year, roughly 100 coffees scored 94 points or higher, a tribute in large part to the ever-intensifying innovation and dedication of the world’s leading coffee producers and roasters. Obviously, all of these 94+ coffees are worthy of celebration, as are the exceptional coffees hovering just behind them at 93 and 92. We couldn’t squeeze them all into our Top 30. We forced ourselves to select the 30 that we felt were worthy of particular recognition. As in past years, we selected and ranked our Top 30 coffees and espressos based on quality (represented by overall rating), value (reflected by most affordable price per pound), and consideration of other factors that include distinctiveness of style, uniqueness of origin or tree variety, certifications such as Fair Trade and organic, and general rarity. Average Ratings. The average overall rating of the coffees on the Top 30 list for 2018 was 94.6 out of a possible 100, in line with 94.9 in 2017, 95.0 in 2016, and 94.8 in 2015. Cost per Pound: From High (Very) to Reasonable. One can’t directly compare the price of Top 30 coffees from year to year because the mix of coffees varies too dramatically. In 2018, for example, two coffees on the list were priced as part of a bundle, and, for the first time in 2018, we recognized two bottled cold brew coffees, which are not priced in the same way as coffee beans. That said, the average price of the remaining 26 coffees on the 2018 list was U.S. $40.23 per pound, down from a record average price of $53.11 per pound in 2017. (The very high average price of 2017 was skewed higher by four coffees that were priced at more than $100 per pound.) In 2016, the average price was $36.61. However, one of the selection criteria for the Top 30 coffees is value or affordability, measured by price per pound. Many of the coffees on our list are priced in line with similar, though usually less distinguished, single-origin specialty coffees in the marketplace. Half (15) of the coffees on the list cost $25 or less per pound. Four were priced at $20 or less per pound, namely: No. 4 Lexington Coffee Tarime Tanzania (95 points; $14.75/12 ounces), No. 6 Barrington Coffee Twenty Five (96 points; $14.25/12 ounces), No. 23 Big Shoulders Coffee Roasters Burundi Buhorwa (94 points; 15.00/12 ounces), and No. 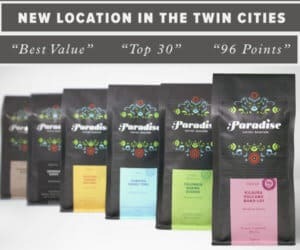 28 Paradise Roasters Ecuador Pichincha Typica (94 points; 13.95/12 ounces). See out list of the Best Value Coffees of 2018. At the other end of the price spectrum, four coffees on the list—a Kona, Yemen, and two examples of the rare and pricey Geisha/Gesha variety—cost $90 to $150 per pound, although roasters tended to soften the sticker shock by offering these exceptional coffees packaged in small quantities. In each of the six years for which we’ve created a Top 30 list, our top pick has been a single-origin coffee—meaning a coffee from a single country, region and (usually) from a single farm or cooperative in that country and region. Previous No. 1 coffees were produced in Yemen (2017), Kenya (2016), Panama (2014 and 2015) and Ethiopia (2013). This year, for the first time, a coffee from Hawaii earned top honors, the 96-point Kona Mocca™, grown and roasted in Holualoa, Hawaii by Hula Daddy Kona Coffee. In the review published in November, it was described in part as “A marvel of a coffee, inviting and esoteric, chimerical and grounded, all at once. Enchantingly rich, intensely floral, unique. Dried black cherry, tea rose, Cognac, chocolate fudge, gently scorched almond wood in aroma and cup.” This rare coffee with its tiny beans and striking cup is available only on the Hula Daddy website through their allocation list. Other coffees appearing on the list were grown in 16 different countries. The most frequently appearing origins were Ethiopia and Kenya, with four coffees each. Origins with two coffees each on the list included Burundi, Colombia, Costa Rica, Guatemala, Panama, Sumatra, and Tanzania. Origins appearing on the list with one coffee each included the Democratic Republic of Congo, Ecuador, Peru, Rwanda, Uganda, Hawaii (United States), and Yemen. Four espressos appear on this year’s list, three of them single-origin coffees. The fourth is a distinguished blend of coffees from a mix of origins—the impressive 96-point Twenty Five by Barrington Coffee Roasters, at No. 6, the only blend on the list. Numerous blends, both espresso and non-espresso, earned 90-94 points but did not ultimately make our Top 30; we recognize some of the best on our list of the Top Coffees by Category. States Coffee & Mercantile’s Reserve Cold Brew made with coffee from Tanzania. Courtesy of States Coffee. For the first time we allowed ready-to-drink, cold-brewed, pure black coffees into consideration for the Top 30. Two superb cold-brewed, bottled coffees made the list, the Bird Rock Red Bourbon Honey-Processed Cold Brew at No. 17 (94 points) and the States Coffee Reserve Cold Brew (from a Tanzania single-origin coffee) at No. 21 (also 94 points). For more on the cold coffee trend see our report Cold-Brewed Black Coffees: Quality in a Can. The absence of certain coffee types from the Top 30 list is also notable. Despite our extensive efforts to turn up quality decaffeinated coffee samples, no decafs earned a position on the list. We uncovered just one 90-point decaf over the course of the year. Another decaffeinated espresso earned 89 points. Over the course of the year, we reviewed fewer than a dozen darker roasts. Most were medium-dark at best; some barely that. The majority of darker roasts we reviewed were sent by roasters in Taiwan and most were espressos, reflecting both the time-honored espresso practice of emphasizing chocolate and sweetness through moderate dark roasting, as well as, perhaps, a preference in Taiwan for more traditional styles of espresso as opposed to the lighter-roasted, brighter style of espresso now popular with the leading edge of North American roasters. For more on our efforts at Coffee Review to wrestle with the current polarization in taste between consumers who prefer darker roasts and those who prefer lighter, see our 2017 report Darker-Roasted Coffees: Confessions and Amends. 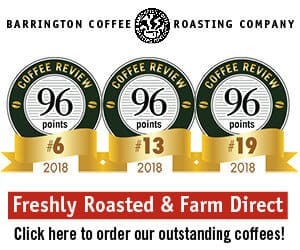 Two roasting companies placed three coffees each on this year’s Top-30 list: Barrington Coffee Roasters (Massachusetts) and Dragonfly Coffee Roasters (Colorado). Bird Rock Coffee Roasters (California), JBC Coffee Roasters (Wisconsin), and PT’s Coffee Roasting (Kansas) each placed two. This concentration of coffees from certain roasters was definitely not by design. In fact, we did our best to reduce the number of coffees from any one roaster on the list—we would prefer to have more roasters appear on the list rather than fewer. On the other hand, from our inception Coffee Review has been committed to starting with what we actually experience in the cup, not with product categories or marketing considerations or fashion. It is true that we took into account some extrinsic factors like value, rarity and sustainable intentions into account when we narrowed the number of very high-rated coffees from about 100 to 30, but ultimately, sensory quality and distinction in the cup, as determined by blind-tasting and as reflected in rating, was the entry point to consideration for the list and the primary influence on where coffees landed on it. To return to geography, 26 of the 30 coffees on the list were roasted by companies in the United States. Roasters from 12 U.S. states are represented. California roasters lead the rankings, with six representatives overall. Five coffees were roasted in Colorado, three in Taiwan. One coffee—the Gorilla Conservation Kanyoni—was roasted by a company in Uganda. In the case of over half of the Top 30 coffees, distinctive tree variety appears to play an important role in generating an exceptional cup worthy of a high rating. There are stars and superstars among the hundreds of varieties of Arabica grown in the world today, and, whether we want them to or not, coffees from these distinguished varieties frequently dominate the very highest ratings at Coffee Review. They include the still rare and expensive Geisha/Gesha variety (three examples on the 2018 list), the various mainly indigenous varieties grown in Ethiopia (three on the 2018 list), the great SL28 and SL34 varieties of Kenya, and (slightly less distinctive but still likely to impress) the big-beaned varieties Maracaturra (one), Maragogipe (one) and the ancient heirloom Bourbon (four on the 2018 list). Finally, two varieties appearing on the list are the ultimate in uncommon: the Sudan Rume from Granja La Esperanza roasted by PT’s Coffee and, at #1 on the list, the tiny-beaned Mocca (also spelled Moka) from Hula Daddy Coffee, a variety so rare that it appears to be grown commercially on only three farms in the world. Processing method also appears to play a significant role in qualifying for the Top 30. On this year’s list, for example, of the 20 coffees for which processing method is clearly identified, seven (vs. six in 2017) were dry- or “natural”-processed, meaning the beans were dried inside the fruit rather than after the fruit has been removed, as is the case with wet-processed or “washed” coffees. Until the last ten years or so, dry-processing was seldom applied to high-end specialty coffees like those that appear on our Top 30 list. This showing is evidence of the continuing trend toward use of alternative processing methods as creative tools for crafting distinctive cup profiles. On the other hand, the appearance of certain coffees on our list also suggests the value of continuity and tradition in processing. All four Kenya coffees in the Top 30 were subject to the meticulous Kenya variant on wet-processing that has been helping produce consistently great coffees in Kenya for decades. The two Sumatra coffees owe their distinction in great part to refined application of the decades-old “wet-hulling” process still largely unique to Indonesia, particularly to Sumatra. See our 2016 report Learning from Sumatras for more on wet-hulling and sensory distinction. All the best from Coffee Review for a happy and prosperous new year, full of both coffee surprises and the reassurance of the fine and familiar. Please enjoy our list of the Top 30 Coffees of 2018 and our Top Coffees by Category.